What would a summer barbecue be without a big bowl of old fashioned potato salad? 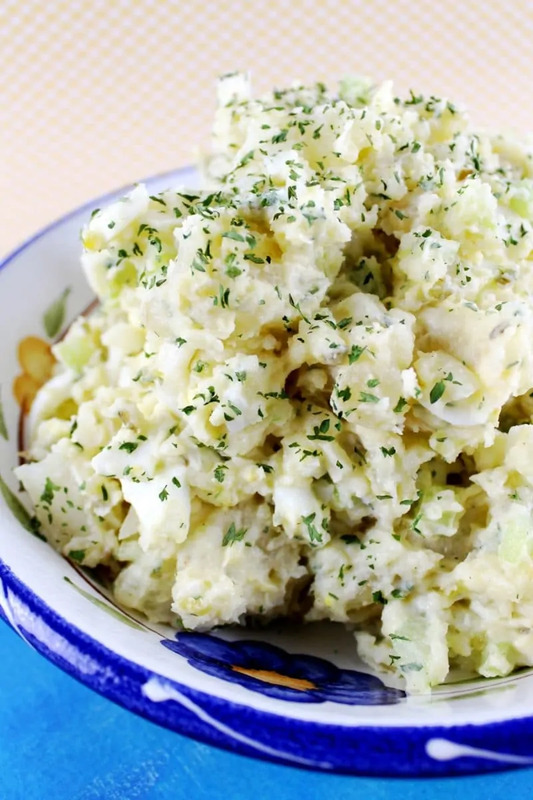 This classic potato salad is one of the easiest side dishes that you can make for a summer party. Best of all, because it uses the same ingredients as macaroni salad, you can easily make the two dishes at once. Talk about saving time. And, you’ll also save money by making sure all your ingredients are used up. This is a great starter recipe. 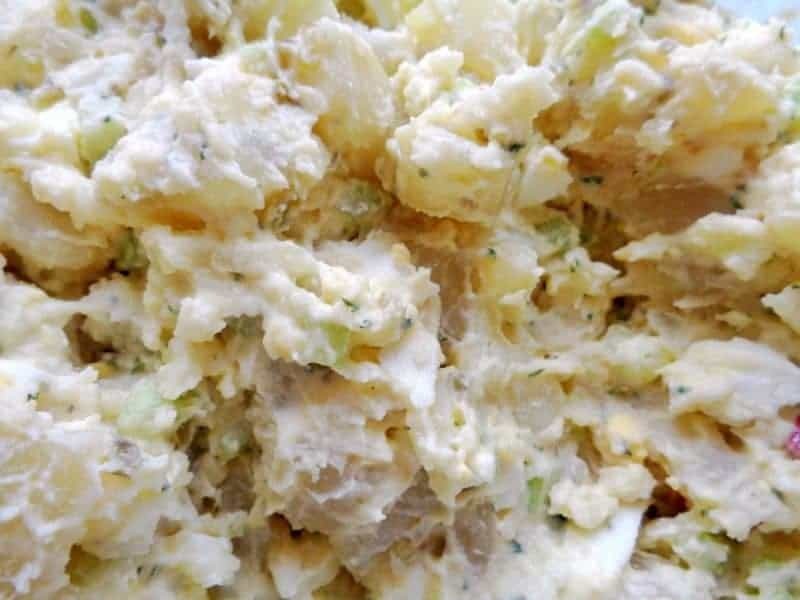 Potato salad is something you can alter in so many different ways. For example, if you want to add a bit of mustard for tang, you can do it. Love bacon? Why not add some chopped bacon? Sunflower seeds are another great addition. Potatoes work well with so many different flavors that it’s hard to go wrong. 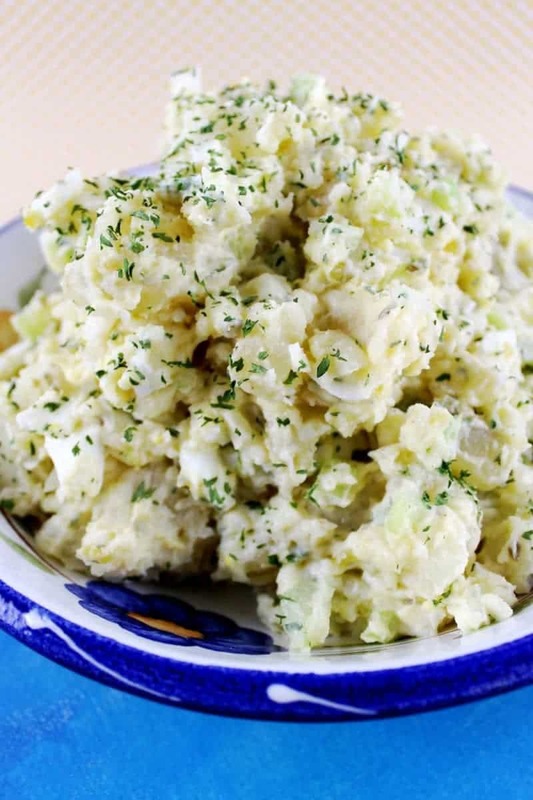 But, you can totally just serve up this old fashioned potato salad as it is as well and your guests will love it. You will notice that I didn't include exact measurements for some of the ingredients in the instructions. That is because you may add more or less depending on your preference. Start by washing and placing your unpeeled potatoes into a large pot. Boil potatoes gently until they are tender when pierced with a fork (about 8-12 minutes). Strain potatoes and set aside to cool. Once potatoes are cool enough to touch, gently peel their skin off. Then set potatoes aside to continue to cool. I usually pop them into the fridge to speed up the process. When potatoes are completely cooled, dice them into 1 inch pieces and place in a large mixing bowl. Add remaining ingredients and stir gently to combine. Be careful to avoid stirring too hard because it will cause your potatoes to break. Allow potato salad to rest in refrigerator for at least one hour for flavors to combine before serving. 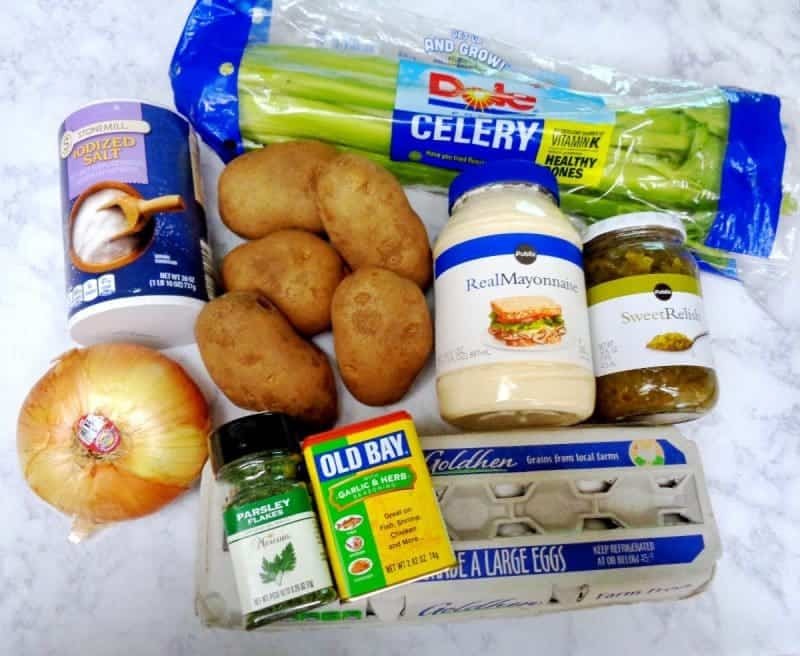 I usually just make a big batch of this old fashioned potato salad the night before I plan on serving it so that it can sit in the fridge overnight, allowing the flavors to combine to the max. Yum! 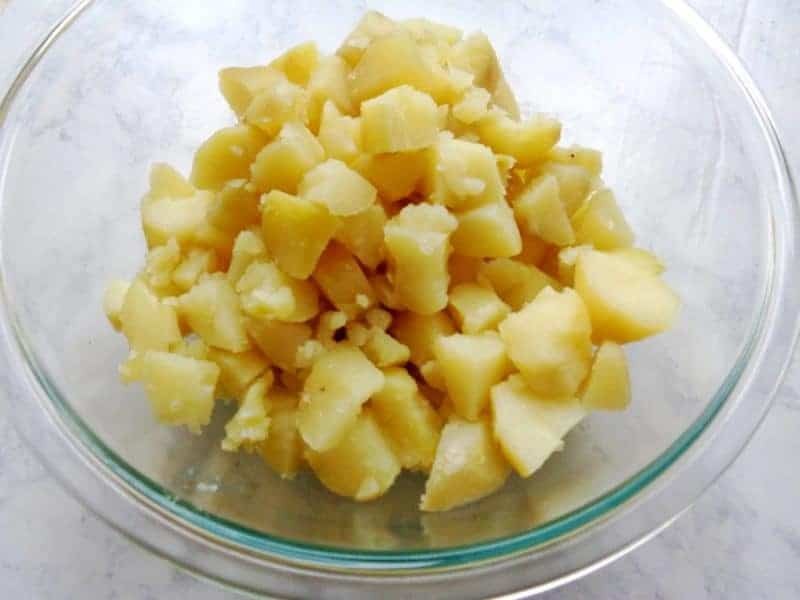 In a large pot, gently boil whole, unpeeled, potatoes for 8-12 minutes or until they are tender when pierced with a fork. Strain potatoes and set aside to cool. Once potatoes are cool to the touch, peel off their skin. Then continue to allow potatoes to cool completely. You can speed up the cooling process by placing your potatoes in the refrigerator. Once potatoes are cool, dice into 1 inch pieces and place in a large mixing bowl. Add mayonnaise, relish, and spices. You may add more or less depending on your preference. Stir gently to combine. Avoid stirring too hard because it will break the potatoes. 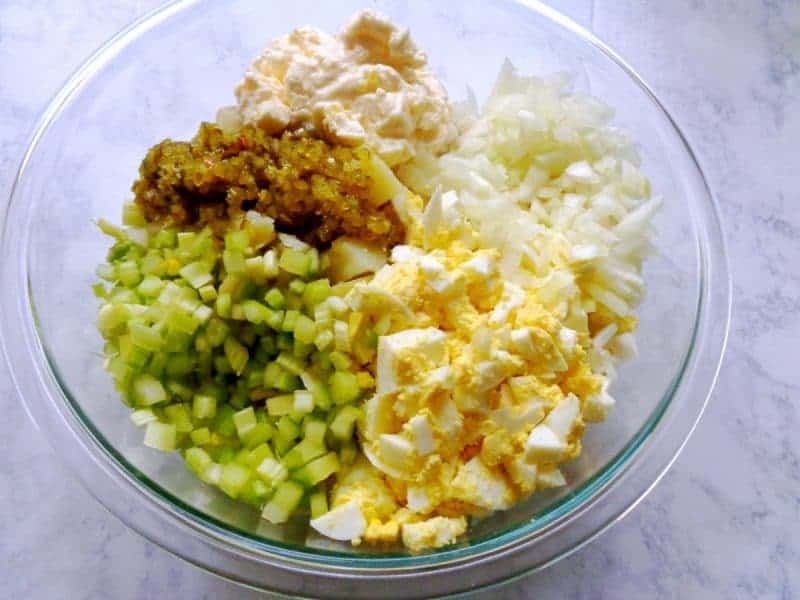 Add sliced celery, diced sweet onion, and chopped egg. Gently stir into potato salad. This is my kind of potato salad … simple and classic. Thanks for the great recipe! Can you believe I’ve never made potato salad? You make it look so easy but I’ve been putting it off because I thought it was hard. Maybe this summer I’ll try it. Sounds like its making a comeback, thanks for sharing! Thank you for sharing this recipe this looks delicious. I love potatoe salad. There is nothing like potato salad at a bbq. I don’t think I have ever made it though. I may need to change that today as now I crave potato salad! I love that you can make two dishes at once with the potato and pasta salads. This recipe looks delicious, I love eggs in potato salads! Going with the old-fashioned recipes is exactly what makes a dish so delicious! 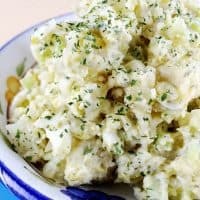 I love how easy and perfect your potato salad is! I can’t wait to try it! Such a classic and a must have for all summer BBQs! I can’t wait to try yours! Nothing beats the classic! Nothing!